Superior Material- Adopted pure cotton/spandex/polyester with great breathability, offers skin-friendly, sweat-absorbent and comfortable to wear, keep you cool without swelter. 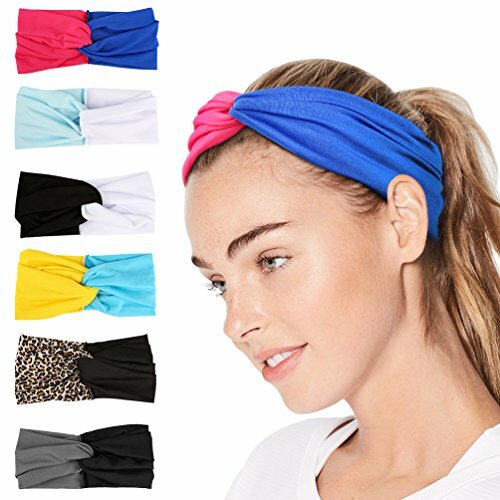 Stretchy & Flexible- Capable to serve as headband, hair band and wrist wraps, keeps your hair stay in the proper place while washing face. Fashionable Appearance- Comes with cross design or unique printing in bright color, brings added fashion elements to highlight your fashion sense and elegant temperament. Nice Companion- Ideal for multiple hair styles like ponytail, short hair and curly hair, prevent the headband from getting droopy and slippage perfectly. Set of 6- Feel free to select the best one to match your outfit, fulfills your various needs with ease, also great for various sports, such as yoga, aerobics, running, jogging, cycling, dancing, etc.